It feels like a dream. We returned from a magical vacation to a serene, beautiful place named Swaswara. In performance appraisals, you would have come across the term "Exceeds expectations". This place has definitely surpassed the high expectations that we had set before the vacation. Our idea of a vacation this time was to just take time out for ourselves and spend more time together in a quiet place, away from city life. Having been to Coconut Lagoon, Spice Village and Marari Beach resorts, we have become a loyal customer of CGH Earth properties. The perfect locations, sumptuous food and lots of activity within their property makes the trips so memorable that you keep revisiting those memories. 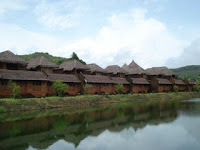 When we were browsing through their site, we stumbled upon Swaswara and found to be a unique resort by itself. Being the off season, we got a very sweet deal for our 5 day stay. After working out the logistics, we knew the trip is going to be excellent. We took the early morning flight to Goa. We were picked up from Dabolim airport promptly and the 3 hour drive to Gokarna through one of the beautiful roads in the country was pleasant. Being my first trip to Goa, I was completely surprised by the greenery, Kerala-like architectural styles, the narrow 2 lane roads with paddy fields and coconut trees. My mind has already added Goa to my to-visit list. The chauffeur was an interesting guy, explaining us about different beaches of Goa, the seasons and people who come to visit Swaswara from abroad. We stopped for a late breakfast at Kamat near Ankola and we reached Swaswara at 12 PM. There were a group of people waiting to give us a reception. It felt a little overwhelming when they explained about different activities we could engage in our 5 day stay. The refreshing Kokum juice provided the much needed breather. From the moment we stepped in, we knew it's going to be one of our best vacations. 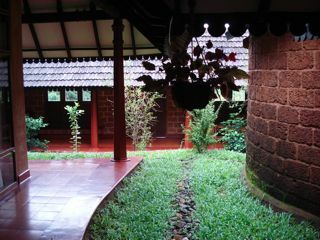 We were shown our Konkan villa and we were just speechless. The villa has a central courtyard with plants, a neat bedroom tucked inside, a open-to-sky bath, a nice backyard stepping onto the rainwater harvesting lake and a little terrace facing the Arabian sea. We were given a schedule for Yoga and meditation sessions, another schedule for art classes, interactive cooking sessions and nature walk. The planner in me started listing out the time schedule. We controlled our urge to overplan since it was our vacation :-) After a nice warm shower, we went for lunch to the restaurant. Healthy, nutritious and tasty - three words to best describe their unique menu. Although it was a typical 5 course meal, it never felt that we were stuffing ourselves. 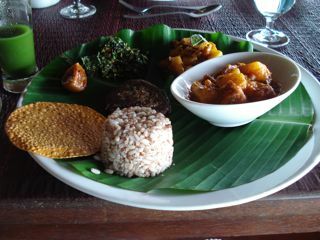 The menu for every meal was so neatly presented that I started clicking pictures before eating. Vegetables like long beans, bottle gourd, red spinach, drumstick leaves etc which I don't normally buy in Bangalore were so tasty. We met the talented chef Mr.Joy and his team. Such simple people with amazing talent ! Yoga Nidhra is our first activity post lunch. It's a practice where your body is resting while your mind is completely aware. As it felt so relaxing, both hubby and I just dozed off during the session :-) Having done Yoga 5 years ago, our bodies have become so stiff and inflexible, we decided to go for a Gentle Yoga session next. Our Yoga instructor, Ms.Juhie was very helpful and didn't put much pressure since it was our first session. With our minds relaxed and bodies stretched a bit, we felt so happy to be in Swaswara. We also started regretting why we didn't choose the 7 day package (the minimum stay at Swaswara is for 5 days). There were just 2 other guests in the 28 acre property with 24 villas. It was quiet, peaceful and calming. We spent an hour in the library, flipping through books on Ayurveda and Yoga. At the end of this trip, my interest towards Ayurveda has increased to a great extent. After dinner, we went for a Gayatri Mantra chanting session. Though chanting this mantra for 108 times was getting a little tough being our first time, the feeling was so good at the end of it. 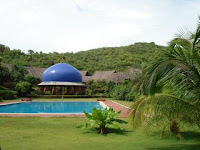 Swaswara team has planned the activities in such a way that your body, mind and soul are energized and revitalized. The next four days were packed with many activities that were the first experiences for me - brushing my teeth using a neem twig, taking bath in neem water etc. These practices which were daily habits for our grandparents brought out the special meaning of our traditions. Though I wish to be more of an artistic and creative person, my left brain had completely dominated over my right brain in my life so far. It's no wonder I have never picked up a paint brush and done something with it. Thanks to Ms.Jyothi, our art instructor at Swaswara, I got a chance to try out different art forms - water colour painting, acrylic colour, glass painting, Warli painting, pencil shading and clay modeling. Another very talented and simple person at Swaswara. Observing her art creations displayed in the art gallery made me appreciate the creative abilities one could nurture and build. Another dream which I have been nurturing is to become a chef. I tried out my hand in a couple of cooking sessions with chefs in the kitchen of Swaswara and noted down a few recipes. Wearing an apron and a chef's hat was a tiny wish which got fulfilled during this trip. After a couple of days of getting used to these sessions, our minds and bodies started to open up and we decided it was time to try out a Progressive Yoga session. It's a little advanced set of Yoga asanas, taught perfectly by our another Yoga instructor, Mr. Ruchir. He is the best example of a person who is always happy and cheerful with a smile on his face, greeting us every time we meet him. He also helped us practice a form of meditation technique called MSRT (mind sound resonance technique). The vibrations you experience in this session makes you feel connected with the universe. It was indeed a unique spiritual experience. Ruchir also conducted a laughter Yoga session which was rather funny and interesting. Being a 28 acre property with lots of trees amidst forests, mountains and the sea (Om beach), Swaswara plays host to a number of different species, especially birds. We went for a nature walk with our naturalist, Mr. Dutta who showed us a few birds, butterflies and ants. Since it was mostly raining in the mornings, we couldn't see many of them. Winter would be the best time to spot a lot of birds. I kept myself so busy in those 5 days that I was going for one session after the next. Yet there was no tiredness or resistance. I felt so active and open to accept new experiences. My energy levels were high and yet, my mind and body was so relaxed. We had some interesting conversations with many people in the team, especially Juhie who was kind enough to prepare a custom Yoga schedule for me to practice everyday at home, Sam and Anil from the restaurant answering our questions on the various dishes served and Chef Joy who gave us good tips on cooking healthy food. I could just go on and on with what we experienced at Swaswara. Everyone who works there gave their best to make our stay pleasant and memorable. Their attention to detail is just mind-blowing. The memories are here to stay forever. In marketing texts, we often hear this phrase - "Customer is king". Indeed, Swaswara team treated us like a king and queen.